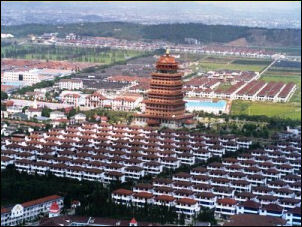 Huaxi Village in Jiangyin County in Jiangsu Province is regarded as China’s richest village. 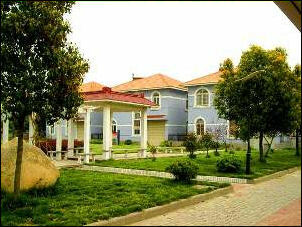 Along its Tree-lined boulevards are identical red-roofed villas with manicured lawns and two car garages. As of 2009, each family had a house and at least one car, provided by the community, and assets of $150,000. Gambling and drugs and talking to outsiders are strictly forbidden. There are no bars, karaokes, Internet cafes or nightlife. Anyone who engages in speculation has their property confiscated. For social activities there are lots of meetings and entertainment provided by the village theatrical troupe. Workers recieve half their income in regular salaries and half in bonuses. People who move from the village forfeit their property. The village’s steel, iron and textiles enterprises brought it $7.3 billion in sales in 2008. The Huaxi Group was the first commune corporation to be listed on a Chinese stock market. The underpinning of the community---the 30,000 migrant workers, who keep the factories humming---receive a much smaller share of the wealth than the commune’s residents. In 2003, Huaxai contained 58 village-owned businesses that did $1.2 billion in business and had fixed assets of $362 million. 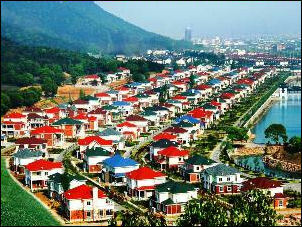 Villagers earn an average of $6,000 a year, a lot by Chinese standards, and live in houses that average 400 square meters. “We have too many investments to count,” said the younger Mr. Wu, the chief executive of the enterprise, which is said on several Web sites to be managed by members of the Wu family. He said he spends his days worrying about investment bubbles, and sprinkles his conversation with references to business advice gleaned at the University of California, Berkeley, and from studies of General Electric’s business model. Mr. Wu’s claims of success are hard to verify, because the conglomerate’s revenue and earnings are not disclosed in an audited form. Published but unverified reports indicate that the corporation employs at least 25,000 people, many of whom live in the urban area of about 30,000 that exists outside Huaxi’s cramped legal boundaries. A 2009 report in a state-run newspaper said annual revenue totaled 50 billion renminbi, about $7.7 billion at current exchange rates. Village leaders have denied persistent reports that Huaxi benefits from substantial government subsidies like low-interest loans, although the younger Mr. Wu said in an interview that some of the village’s ventures are financed by debt that amounts to as much as 60 percent of their value. Huaxi’s so-called New Village in the Sky “at 1,076 feet, a bit taller than the Chrysler Building in Manhattan “is getting finishing touches this summer in preparation for an October opening. Among other attractions, it will have a five-star hotel, a gold-leaf-embellished concert hall, an upscale shopping mall and what is billed as Asia’s largest revolving restaurant. Also, it will have five life-size statues of a water buffalo, Huaxi’s symbol, on every 12th floor or so. 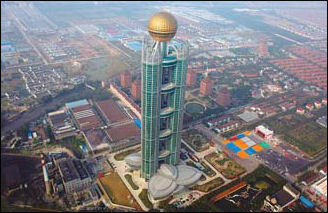 That this half-billion-dollar edifice is a good 40-minute drive from a city of any size is part of the plan. “We call it the three-increase building,” said Wu Renbao, 84, the town’s revered patriarch, meaning that it will increase Huaxi’s acreage (by half), increase its work force (by 3,000) and, hardly least of all, increase its wealth. If he is right, all 2,000 villagers will get a little richer. They all own a piece of the building “just as they own the town’s steel mill, textile factory, greenhouse complex, ocean shipping company and other ventures. That is Huaxi’s carefully curated narrative: by rigidly adhering to socialism with Chinese characteristics, the citizens of this little village have created an oasis of prosperity and comfort that is the envy of the world. Over a year, one of the building’s water buffalos has grown in value by 70 million renminbi, or about $10.7 million. That would be the buffalo destined for the 74th floor. The one cast in solid gold.